Mianmaa a wah konchri ina Ieja. 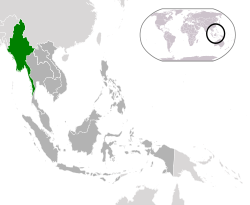 Mianmaa is baadad by India an Bangladesh to di wes, Thailand an Laos to ieas and China to inort an norteas. Di konchri's 2014 sensus counted seh di population fi be 51 million peeple. As af 2017, di population is about 54 million.